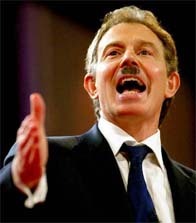 Our Beloved and Glorious Leader Herr Blair. Obviously foreign, these people's poverty and incompetence is in clear violation of various spurious UN resolutions and an obvious affront to international dignity. This is not propaganda designed to sway a sensibly sceptical public. Its all really really true, honest. Check back daily! In an amusing parallel to the events of 9/11, America has used all the technology it has at its disposal to reproduce the drama and tragedy a thousandfold! Americans do not shelter behind cowardly suicide bombers, but instead use their brave cluster munitions to take out enemy cities! Already the people of Baghdad feel the true vengeance of America for the evil attacks on the world trade center, even though they didnt really have anything to do with it. But hey, they are poor and wear rags on their heads. To back up our claims that it is a just war, we can site at least 4 canisters of warfarin and some potentially lethal cough medicine. Also, its jolly tough for our boys out there so you should just shut up and leave war to the professionals. An attack on Baghdad's international airport has been launched, according to Axis officers. Coalition forces are targeting Saddam Hussein International Airport, 12 miles south west of the city. Most of Baghdad was plunged into darkness following a power cut and massive explosions have echoed across the Iraqi capital. Air Marshal Hermann Goering, commander of Dachshund forces in the Gulf, said the advance on Baghdad was the most impressive military manoeuvre he had seen. He said: "They will be writing about it in staff colleges for decades." Axis forces have taken part in a fast-moving two pronged advance on the city. The Axis Army's 3rd Infantry Division, backed by the 82nd Airborne Division, closed in from the south west as Axis SS troops moved in from the south east. On the approach to Baghdad itself scores of burnt-out Iraqi army vehicles and dead fighters littered the roadside. Allies open first mobile voting booth! In a bid to win hearts and minds, captured Iraqi soldiers and mutilated, starving civilians have been offered a free chance to vote on whether they wanted to be liberated and killed by the latest US-UK offensive! Jeb Bush will be personally overseeing this latest allied initiative and we expect the majority of Iraqis to overwhelmingly endorse the appropration of their oil reserves by the trustworthy and responsible American administration. Our glorious soldats are involved in a huge panzer battle in which the enemy has been ripped apart. 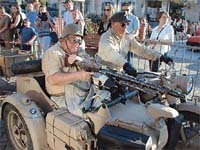 Troops of the dastardly Iraqi forces attempted to break out of the besieged city of Basra, but met with the glorious Desert rats panzer division, who annihilated the enemy column, destroying over twenty enemy tanks. Our glorious panzers outflanked the enemy while supressing fire was laid down by the soldats of the infantry with mortars and Panzerschrecks. Our superb panzers accounted for twenty enemy tanks and more armoured vehicles, before the enemy retreated back to their city hell hole! Stukas then provided the necessary ground cover to ensure the battle was won by our glorious soldats! Our allies have finally opened a new Northern front in Iraq, where they plan to advance southwards to Baghdad to join our glorious soldats coming up from the South. Our glorious soldats are making Southern Iraq safe from the Iraqi dictator's evil grasp, so that liberated people of the Dachshund may use them as for Lebensraum. Meanwhile we are taking miles of sand in western Iraq unopposed as our superior forces sweep forwards. The Iraqis have failed to defend the valuable desert areas of Iraq and many sand dunes have now been liberated! The sand, in its desire to belong to the Dachshund for superior road building material has actually been throwing itself at us in a sandstorm so it may be liberated. The Iraqi forces are threatening to use chemical weapons on our glorious soldats however we will take revenge for every soldier killed using chemical weapons, with comprehensive strikes against those responisble for damage to any member of the Dachshund advance! Iraqi forces are now losing control of their own people. 2000 workers and volunteers are attempting to leave the city of Basra to start working for the Dachshund authorities before they are even officially liberated, showing their desire to be working for the Dachshund and help in the creation of more jackboots! Iraqi militia forces, incompariable to our own Volkstorm, attempted to stop these 2000 people in an act of treachery as they try to halt Jackboot production, but are being thwarted by the shining beacon of glory that is the state of the Dachshund! The Iraqi capital received a pounding with axis "bunker-busting" bombs and a reported attack on the Baath party headquarters by Heinkel 111 and Stuka bombers. People of the Dachshund show that they are not only efficient, ruthless, cold hearted people earlier today when a Kriegsmarine ship docked in Umm Qasr, liberated early on in the war for its distinct lack of vowels and clear need of Dachshund influence. The ship contained many tons of aid to help the workers of the new Dachshund state start up production of high qualitiy jackboots and leather jackets as soon as possible! Iraqi troops are in full retreat and in an exclusive press release to "Der Sturmer" the glorious Fuhrer, Tony Blair, announced from the NummerZehn Downings Strasse Flak Bunker that the war was and is going to plan! This is Edpow1 reporting from the Front Lines! Ignore the facts. Ignore the law! just support our soldiers bravely dying for our beloved leader Tony Blair! Remember, it is now illegal to download pirate anti-war songs, and anybody doing so will have their credit rating blacklisted. Already our brave soldiers have secured several important sand dunes, and in several major newspapers we have seen the royal family delicately doing nothing. Forget the humanitarian crisis! our brave troops have already secured several key objectives, we just don't know what they are yet. Perversely the arab-based news channel ALbaniabeera refuses to transmit our propaganda. Dont they know there is a war on? surely they should transmit nice happy images of joyful panzers and not children with no arms and legs? In a direct contravention of the geneva convention, Iraqi children have been defending themselves against depleted uranium. This is a Just war, honest, we are sending all these third world people to heaven just a bit quicker than normal. New Smart bombs developed to offer "news bulletins in advance"
By the time you have read this, it will all be true! Coallition Forces are now so technologically superior, and evertyhing is running so much to plan, that we can now confidently issue news bulletins before we actually write them! People of Dachshund! the Iraqi's are a real threat to your personal well-being, and will stop at nothing to prevent you from downloading mp3s and pirating software. Already our valiant cruise missiles launch themselves in suicide bombings, and brave squadrons of scientifically trained Dolphins look for mines deep in the Iraqi desert. This is a war unlike any other, except for the last few, and the Dachshunder High Command expect you to stand resolute against the Iraqi's, whose defiance is deeply worrying to several very high placed vested interests. Victory will be Ours in Days, maybe, we just don't know which yet. Click here for transmission 1, and transmission 2. 10.15am 50 Iraqi tanks 'halted outside Basra' by our glorious Panzers! Glorious soldats from the Dachshund advance, despite the fierce weather and various annoying arabs defending their country. Our troops come every closer to the enemy's capital as every second goes by. Iraqi losses are high and in the first pure panzer battle of the war, Panzers of the Dachshund destroy nearly twenty enemy tanks as they try to break their way out of the Basra encirclement. People of this city, upon hearing news of the incoming troops of the Dachshund are attempting to fight off the forces of the evil invaders as they show their Dachshund Party membership forms, secretly hidden throughout Saddam's regime. Victory is near! Saddam Hussein has been described as sounding like the eternal enemy of the Dachshund and notorious leader of the Untermenschen, Josef Stalin! This encourages our brave soldats even more to vanquish the evil dictator. Our glorious soldats will not pause until their task is complete, for the good of the Greater Dachshund! The people of the Dachshund fight for three things! People! Party! and Patriotism. Our glorious soldats are showing the world the might of the Dachshund! The Iraqia have shot down as helicopter from our allies, but we are sure of victory, as shown by the devastating effect of our panzers as they humiliated the Iraqi armour earlier today! The enemy capital of Baghdad has been continually pounded by the glorious luftwaffe in raids reminiscent of the Blitz. We march forwards together for victory! Axis forces launched punishing attacks overnight on the Publican Guard divisions that are already calling last orders and forcing the squaddies to accumilate outside the kebab van so they can attack the townies. Iraqi resistance, contrary to boasts by Saddam Hussein's regime, was "patchy" and "sporadic", they said, and the assault on Baghdad was on schedule. Overnight He-111 bombers attacked the ring of defences around the city. The dull thuds of the bombs could be heard in the city centre more than 30 miles away. The axis have taken 3,000 Iraqi soldiers prisoner, while "many others" had deserted, not including those that our brave rocket launchers have liberated from their lifestruggle with our special peace bombs. The Iraqi troops may also be planning on using chemical weapons against axis troops, but the Fuhrer has stated that he will strike back on every Iraqi responsible for any form of gas attacks. Union Carbide officials have stated in advance that their corporation is in no way responsible. 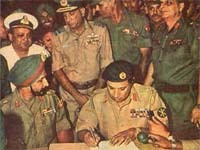 This is news correspondant (GD)Edpow1 reporting. - Special American 'peace bombs' liberate thousands, whether they like it or not. "We know whats good for em", says General Frank. People of the Dachshund are reflecting upon the loss of one of our glorious soldats in fighting against treacherous Iraqi troops dressed as either soldiers ior civilians. This is an absolute disgrace and goes completely against the Geneva Convention. Our brave soldiers march forwards wearing full military battle dress, including heavy leather boots and full length trousers in the blistering heat of the sun. If we were to stoop right down to Iraqi levels we would have to let our troops march forwards in T shirts and shorts with flip flops and suncream. This is jsut not acceptable. We are playing by the rules of war, Der Sturmer emplores that all Iraqi untermennschen soldats should follow our examples and fight properly, play cricket and drink tea! There is no honour in killing a man without full battle dress on! Our glorious troops avenge the death of their fallen kamaraden and keep marching forwards to smash the eveil troops of the Iraqi fiend, Saddam Hussein. A pre recorded messege of the Dictator of the oppressive regime was shown on Iraqi Television today, in which he foolishly promised his troops a victory he can not deliver. We will soon crush the fiend and secure the middle east leather supplies. An Iraqi general claimed that the following was true, "Our brave and heroic forces have shot down up to five fighters and two helicopters. One fighter was shot down near Baghdad, another near Mosul, a third at Akhtar Rashid, a fourth in the Taji district, another in Basra. A helicopter was shot down at Mosul, another in the Samara area." As reporters like to say, there was no "independent confirmation" of these claims. We can confirm that this is complete and utter rubbish as the Iraqis become more desperate for things to inspire their almost crushed forces. People of the Dachshund will strike hard and fast at the capital of Baghdad as we destroy the Iraqi divsions on the way to the fiend's capital. This is the true story of the war and for what is happening to those fools who try to fight our powerful, superior forces. "24 March 2003 - He was barely visible beneath the pile of rubbish ­ a decomposing Iraqi soldier forgotten beside the road, flies swarming around his blood-soaked hair, a helmet upturned next to him. Earlier, dogs had been gnawing at his hand." This scene is not uncommon as the terrified Iraqi criminals flee leaving their dead comrades form our overpowering advance. The dead Iraqi's body provided a stark reminder that local forces, armed with rusty, yet effective, AK-47s had come up against a far mightier blunt instrument in the shape of the soldats of the Dachshund. Yesterday, droves of Iraqi soldiers continued to surrender to the axis forces. In the southern Rumaila oilfields alone almost 1,000 men were held in a temporary prisoner-of-war camp. These vicotries for the Axis forces in Iraq are undenyable proof that the Iraqi foe is weakening by the second and we will soon have victory over all enemy forces! Our glorious troops led by the Fuhrer will soon achieve the victory that is ours by right and we shall pravail over our foe! Saddam Hussein probably survived the initial cruise missile bombardment of his bunker in Baghdad but received minor injuries in the attack, the Dachshund Government said yesterday. Der Sturmer says to all our troops that it is their duty to exert a swift and brutal revenge on the Iraqi forces left in the country, as our panzers roll ever forwards we will be victorious! In a special interview today (GD)Edpow1, from the GD Propaganda Ministry, questions the Fuhrer on the latest developments and what really is happening, with news direct from Nummer Zehn Donwingsstrasse Flak Bunker. This recording and extract has been carefully monitored by experts from the Ministry of Public Information and Propaganda. The interview was conducted over MSN, the latest GD field communication technology. Edpow1: Mein Fuhrer, can you verify the reports of missing planes? Tony Blair, our genious Fuhrer: The axis forces say they are not missing any planes, our glorious pilots would not be shot down from their magnificant Fleugzeugs by petty Iraqi withering gunfire! The people of the Dahcshund know this, and they know this as fact! Edpow1: According to enemy reports one airsoldat has been captured, another is on the run, reporters from axis forces tried to find him before the fiendlicher Iraqis, but they are still looking and only iraqi soldiers are allowed where the parachute was seen to have landed. Sources say they burning the reeds to smoke him out. Some axis forces say they are missing aircrews apparently. Can you confirm this mein Fuhrer? Tony Blair: That was hours ago Edd, didn't you get the release from the Ministry of Ordinance, through the ministry of Agriculture, sent via a correspondant from the Ministyr of Flower Arranging? It was that simple. Edpow1: Plus reports say that some of our allies soldiers were captured and some killed on top of reports saying that parachutes were seen in Baghdad and al Jazzera tv claims one airman has been captured, what is your response to these alligations, from Al Jazzera Broadcasting, mein Fuhrer? Tony Blair: you believe Al Jazzera? Tony Blair: If an air man had ejected over central baghdad i dont think they would be able to capture a glorious soldat of the Dahcshund, most likely he is trying to find the evil leader himself and take over the country, all our soldats fight gloriously for the Dachshund! Who are the 'lots of people?' Are they eye witnesses? Fritz take down the details of every eye wittness and send out Gestapo units, immediatly, oh excuse me Herr Edpow1, as i was saying, I think it was probably a dirty rumour or that some kind of debris from the weak enemy vehicles landed in the Tigris and then people there started making up sories which spread like chinese whispers. I will emphatically state that no Airmen have been captured, and all our soldiers fight ever onwards for every Dachshund loving person. We have Ein Volk, and everyone who is part of the Volk shall never forget these momentous days and the sacrifices of our soldats in securing the Middle East Leather trade! To our glorious soldats i say, keep fighting, yours is a just and worthy cause, onwards to the heart of the enemy's empire! Edpow1: Jawohl mein Fuhrer, Sieg Heil Sieg Heil, entschuligung, i was taken over by emotion just then. Your words, as ever, mein Fuhrer, encourage and inspire the people of the Dachshund! Your words are the truth, but please, we have little of your precious time left, what of the soldiers of our allies, led by Beneto W. Bush who are reported captured and dead? Tony Blair: The prisoners from our allies who have been taken and those who are dead were probably part of small logistics convoy tht took a wrong turning out in the desert and got caught by Iraq's weak, untermenschen slodiers. This is put down to poor map reading and lack of understanding of logistics and an inability of the Fiendish Iraqis to put their road signs in English, as well as Arabic. I am afraid i must now give a speech over the Dachshund Radio service, it has been a pleasure talking to you, and sorting these "issues" out. Edpow1: Danke schon mein Fuhrer, your words are comforting to use all in these difficult times. There you are, the words from the Fuhrer himself, direct from the Downingsstrasse flak bunker. To summerise, the reports of the troops led by Beneito W. Bush being captured may be true, but all other things are lies based upon no fact in an attempt to stop the ineveitable crushing of Iraqi forces under our superior force's heel. Key postitions have been taken by our panzers which are continuing northwards towards Baghdad, with the region's leather supplies no longer in doubt. The port of Umm Qasr will be opened within the next 36 hours for the shipping of leather jackboots to the heart of the Dachshund. This glorious news comes as our troops claim to have advanced 300 miles into enemy territory, accounting for the territory taken to get our troops to the borders of Iraq, that means we are now looking at a vast empire of thousands of miles! The superiority of our forces is now showing has our panzers roll onwards! The people of the Dachshund sing the marching songs that the panzer commanders sing to show their support, soon we will have total victory! This is war correspondant (GD)Edpow1 reporting on behalf of the Ministry of Propaganda. Columns of our panzers march towards the lair of the Iraqi beast, with thoughts of the Fuhrer and the greater good of the Dachshund race keeping them sustained as they continue day and night through the heartland of the enemy. It is obviously clear that the superior Dachshund troops led by the Fuhrer from the Zehn Downingsstrasse flak bunker are doing all the work, due to our casualties being just under double those of our allies. Furious fighting by the Dachshund troops stopped our allies retreating and forced them on forwrads with the same will and desire for glory that we know drives our men onwards. The immense propaganda machine, led by John "Goebbels" Simpson, is stepping up a gear as reports of captured towns filter through from the front. Our glorious head of propaganda is said to be advancing from the north on his own to link up with our panzers within Baghdad, as he did in the Spainish Civil War when he "liberated" Kabul for the greater good of the Dachshund and for the Reichsminister Whittman's total control of the poppy fields. Our allies have halted outside a town, whose name i can not pronounce, meaning it is obviously foreign and free from Dachshund influence, therefore it is a breeding ground for Untermenschen and must be "liberated". Our troops march ever onwards to the sounds of Marching songs and fight their lack of sleep by drinking unhealthy amounts of Schnapps and pillaging the local women. Baghdad is continually rocked by massive airstrikes as we fulfilled the Fuhrers promise that if one bomb landed near our soldats, one thousand would land near theirs. For the four missiles fired at Kuwait, and our glorious soldats, 4000 bombs have now been unleashed into the heart of Baghdad creating a city of burning Persian rugs and opium dens, the smoke that usually surrounds the city is reported to be thicker than ever tonight. Our howitzers are firing upon all targets available, including small cats and paperboys using their new weapons to help in the war effort, while young soldiers from the Hitler Jungend, or "Labour youth" service shoot cats and paperboys back home with their air rifles to reenact these brave events on home soil, in preparation for their calling to the front. The propaganda ministry is upping its efforts as our troops advance on all fronts! Turkey, our uneasy ally, has, in recent years, been showing a great interest in the solid leather jackboots of our soldats, there is now a fear that they too may wish for a share of the middle eastern leather supply, so occupied Greece has an army group stationed ready to strike at a moment's notice against our ally to keep the leather free for all pure people of the Dachshund! The people of the Dachshund awoke to the sad news of the lose of eight of our soldats and four of our allies in a tragic air crash, should the war be lost we will testify that this was a war crime, however, if it is won, as we think, then these men will have not given their lives' in vain allowing people of the Dachshund to own as many pairs of leather jackboots as they desire! Our panzers roll forward to the jackboot fields of southern Iraq and onwards to the heart of the enemy's territory. The brave soldats of the Dachshund never stopping once to rest will soon ensure total victory. The Luftwaffe have kept up a constant bombardment of the enemy forces, who continue to fight on, despite the odds. To these foolish men, we salute your deaths in aid of our target practice! On the eve of battle our troops prepare for the great assault, at 6pm the great offensive begins with artillery and rocket fire, the panzers roll forward with increasing spped heading for the vital Leather supplies for yet more jackboots! The Fuhrer's emotive speech was a work of genious persuading all who would not support war to shoot themselves before the SS did so! Our troops captured the towns along the evil Untermenschen's borders. British troops Have taken a large port and the bombing of the enemy's capital has continued, as promised for the four missles launched at us, we respond with Ein Thousand times the destructive force! The heart of the enemy's empire burns as the victory comes ever closer. The Grossdachshund Division are gloriously supporting our troops as they march forwards into battle against the Imperial Guard Of Saddam Hussein's inferior troops. The victory is expected to be quick and easy, against troops with inferior equipment moving East. Tony Blair has therefore decided to call the new offensive "Operation Barborrossa" As the British troops take a Blitzkrieg that should be over before the end of the summer. Britain's new world order in Europe has been established as we clearly ignored the French at the negotiation tables, as every strong nation has since the Treaty of Versailles! Tony Blair will lead the troops from the front, in his UberFuhrerDowningStrasse Bunker, situated in a secret location in London. With the backing of the National Socialist Westminster Bank our superior axis with our Allies is reminiscent of the Deutsches - Italian pact in which the strong, pure powerful troops allied with the only army in the world to have tanks going faster backwards than forwards! Leading the charge into the "Lair of the Iraqi Beast" will be crack SaS, abrieveated to SS Kommando units from the elite Bavarian Guard . In honour of our military heritage and disregard for humanitarian aid the GD Clan will be giving full coverage of what really is happening in Iraq and what is going on behind the closed doors of the Fuhrerbunker. Day to day coverage will give you all the battle coverage you could need. Gentlemen, Mein Herren, I give to you, the war diaries! The leaders of the axis of power issued a direct statement to the Iraqi fiend! Our glorious Fuhrer, and his fellow axis leader Benito W. Bush gave Saddam 48 hours to leave the country, but with all the roads blocked, he can not escape, making war inevitable and the ability to achieve our objective of securing the Middle East leather supply for Jackboots and Gestapo uniforms well within our grasp. Kamaraden, diese ist Geschichte! Our glorious Fuhrer has finally stomped upon the League of Nations overthrowiung the humiliation of Versailles and ignoring the French entirely! The plans for invasion have been openly laid down and our brave troops are preparing to attack. While George W. Bush gave his speech, glorious foreign minister Jack Straw actually "mooned" the French ministers humiliating their entire weak country. We are now heading for war! The Fuhrer sends out a telegram to each soldat wishing them luck and to show no mercy in the annihilation of their enemy! The Fuhrer has stated there is a clear threat to the supply of cheap Middle Eastern Leather and that will ruin the current optimum supply of cheap Jackboots to the soldiers of the Dachshund. Once again the French spies tried to infiltrate the conference with ideas of fighting only for oil, however the SS guards were on hand to deal with these fools. Spain, long term ally since allowing us to bomb Barcelona to the ground in their Civil War are well on our sides.